• That great fare you found a minute ago just went up hundreds of dollars. • That perfect flight you found a minute ago is now nowhere to be found. 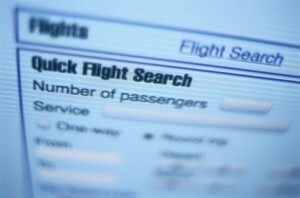 • No one search site includes every airline. • The number of frequent flyer miles it used to cost to fly roundtrip is now the number it takes to fly one way. • No matter how many months in advance you attempt to book using economy-saver frequent flyer miles, there will be only ONE flight available with seat inventory. And it won't be the date or destination you want. • After you agonize over and carefully select the flight most convenient for you, several months later you will get a notice that there's been a slight change. Now you have a six hour layover instead of one. • Buyer's remorse: should I have waited to buy? what if the prices go down next week? • There are so many enormous variables in air travel that you can't control, i.e. a pilot strike, the airline going defunct, snowstorms, ice storms, illness. It's all very difficult for a control freak to handle. I had an equally frustrating weekend trying to book flights to Europe for our school break in March. We wanted to use frequent flyer miles but, of course, I can't find available flights to the city we want to fly into. It's the taxes and surcharges that I find unbelievable though - for our family of 4 our "free" tickets using Air Canada Aeroplan miles were going to cost us about $2400 in taxes and surcharges!! I still haven't booked anything because I'm rethinking the plans but the whole process just seems to get more and more frustrating each time we go through it. Hi! I am your newest follower. You have a fabulous blog! I can't wait to read your archives. My little man is 8 months and I cannot wait to plan a trip for next fall! thanks for your comment on my blog! i'm now following! I just had a bad experience with Delta and won't be flying with them again! They changed my family's flight so many times that we were completely unable to make the flight time and they switched us from non-stop to multi-connection! I flipped out since I had bought the tickets several months ago and I ended up having to cancel (and wait 8 weeks for my refund!) and buy much more expensive tickets to get us to our destination. Ack! And they say there is nothing we can do about these types of situations! @ Lisa and @Connecticut Realtor: Sigh . . . I know. Everyone has such terrible experiences to tell about flying. Trips and vacations are supposed to be enjoyable, but the airlines sure take the fun out of it!